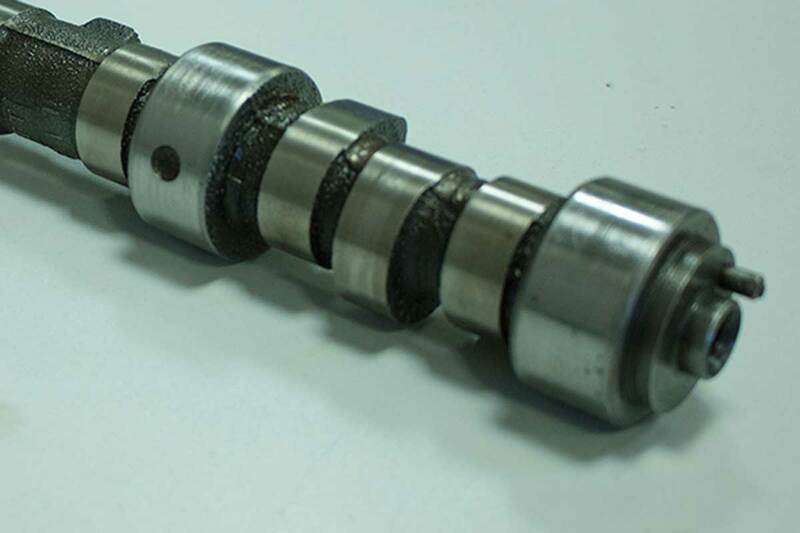 This means that the camshaft has been turned from a round steel bar and will normally be nitrided after grinding. We use this method for low volume production and, due to the work involved, they are always more expensive than cast blanks. Unless specified, the camshaft is made from a chilled iron casting. This is the best material for camshafts, as it has far superior wear characteristics than any other material. A regrind on an existing camshaft, only suitable for mild grinds on existing chilled iron camshafts. If you regrind case hardened steel camshafts you will remove the case hardening. We only regrind chilled iron cams, but prefer to supply new units. This is Grade 17 cast iron with an addition of 1% chrome to create 5 to 7% free carbide. After casting, the material is flame/or induction hardened, to give a Rockwell hardness of 52 to 56 on the C Scale. This material was developed in the 1930’s in America as a low-cost replacement for steel camshafts and is mainly suited in applications where there is an excess of oil, i.e., camshafts that run in the engine block and that are splash-fed from the sump. (This is the material that the Ford OHC camshafts were manufactured from). It is not the most suitable material for performance camshafts in OHC engines. As a company, we only use this material for performance camshafts if the camshaft is splash-fed in the sump. A material giving similar characteristics to hardenable. Its failing as a camshaft material is hardness in its cast form, i.e., Rockwell 5, which tends to scuff bearings in adverse conditions. The material will heat treat to 52 to 58 RockwellC. This material was used by Fiat in the 1980’s. Chilled iron is Grade 17 cast iron with 1% chrome. 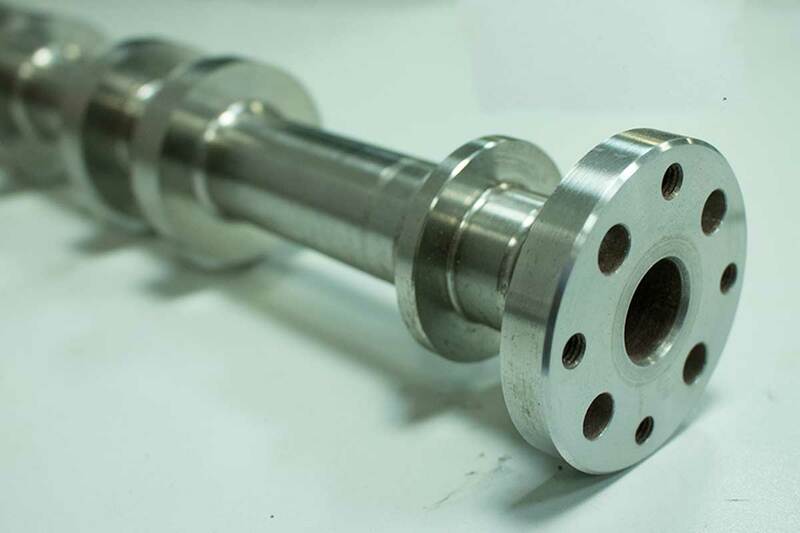 When the camshaft is cast in the foundry, machined steel moulds the shape of the cam lobe are incorporated in the mould. When the iron is poured, it hardens off very quickly (known as chilling), causing the cam lobe material to form a matrix of carbide (this material will cut glass) on the cam lobe. This material is exceedingly scuff-resistant and is the only material for producing quantity OHC performance camshafts. 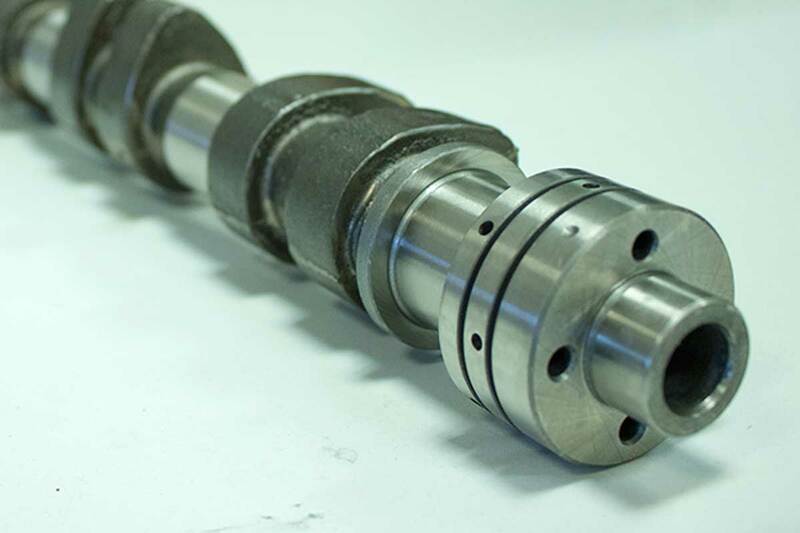 When purchasing a camshaft, enquire which material the camshafts are produced from. A chilled iron camshaft may be more expensive, but its resistance to wear in all conditions, far exceeds any other type of cast iron. Used mainly in the 1930 to 1945 period and is currently used for induction hardened camshafts in conjunction with roller cam followers, due to the through-hardening characteristics of the material. Used by British Leyland in the A Series and B Series engine and best when run against a chilled cam follower. The best steel for camshafts. When nitrided it gives a surface hardness and finish similar to chilled iron. We used this when replacing chilled iron camshafts in competition engines. This material is used on several of the current F1 engines. In general, steel is a good camshaft material. However, the type of steel has to be matched with the cam follower it runs against, as different grades of steel have different scuff characteristics. This has been a very simplified explanation of camshaft materials, based on over 48 year’s experience. It may assist you to ask the correct questions when purchasing performance camshafts. Now that you know all about choosing the correct performance camshaft. View or download our Camshaft fitting guide.